The trade deadline isn’t until March 3, but the movement has started with a bang. On Sunday morning, TSN reported that the Calgary Flames and Toronto Maple Leafs have agreed to a seven-player deal that sends star defenseman Dion Phanuef to Toronto. Going east with Phanuef are forward Fredrik Sjostrom and defenseman prospect Keith Aulie. Coming back to Calgary in the trade are forwards Niklas Hagman, Matt Stajan, Jamal Mayers and defenseman Ian White. 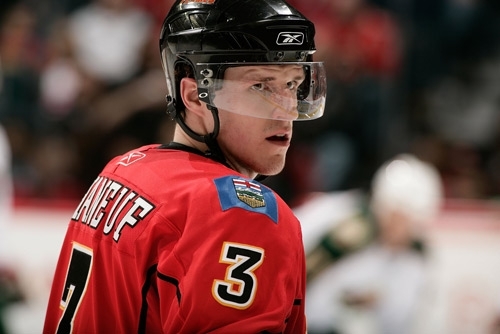 Phanuef was drafted ninth overall in 2003 by Calgary and is a two-time Western Conference All Star. He was a surprise omission from Canada’s Olympic team this year, and his overall production has been down all year. He has just 22 points (10 goals, 12 assists) in 53 games; he hasn’t finished a season with less than 47 points in his NHL career. Sjostrom, 26, has six points in 46 games this year. What does this deal mean to the Western Conference playoff picture? After just completing a miserable 4-8-3 January that left them clinging to a one-point advantage on Detroit for the eighth playoff spot in the Western Conference, this deal, on paper, appears to fix almost all of the issues in Calgary. Gone are Dion Phanuef and a couple of guys that really aren’t worth much more than salary. Of course Phanuef, the team’s top draft pick in 2003, is coming off consecutive All Star Game appearances, so this certainly wasn’t a small price to pay. But the bounty the Flames received back makes this deal worth it. 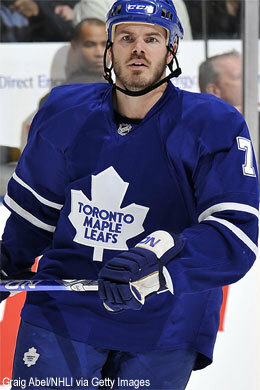 Hagman was Toronto’s leading goal scorer with 20, and Stajan was second on the Leafs with 44 points. Oh, and White has outplayed Phanuef this year on the blue line as well. The net result of this deal is an increase of 80 points in 2009-10 production from the four incoming players. The Flames averaged only 2.13 goals per game in January, and that’s with Saturday’s six goals and a four-goal loss in Anaheim included. Poor Mikka Kipprusoff hasn’t had any offense to support some incredible efforts during the month. Now, the Flames could realistically skate a top line of Hagman, Stajan and Jarome Iginla that would have 125 points between them. The second line for Calgary could now include Rene Borque, Curtis Glencross and Damond Langkow, a line that would have scored 95 points this year. There is not denying the upgrades made to the forward lines in Calgary with this deal. What makes the deal even more impressive is bringing back White in the package. White likely won’t play as many minutes as he was in Toronto (23:47 per game), but adding someone with his scoring ability to the already-talented group of Jay Bouwmeester, Mark Giordano and Robyn Regehr means that this deal won’t negatively impact the depth Calgary had on its blue line for the sake of adding offense. The Flames now have two weeks before the Olympics to work out their lines and figure out their chemistry for a big playoff push in March and April. Making this deal, however, will go a long way in helping Calgary compete in the West. The next domino to fall is a reported deal between the Leafs and Anaheim Ducks. Yesterday, the Ducks agreed to a four-year, $18-million extension with Jonas Hiller, and today Darren Dreger of TSN is reporting that Jean Sebastian Giguere has been dealt to Toronto for Vesa Toskala and Jason Blake.. Giguere has one year and $7 million left on his contract after the 2009-10 season, while Toskala makes $4 million this year and will be an unrestricted free agent this summer.